This was such a hard shot to to take. I was actually at a nearby location trying to shoot an image that wasn’t there. Just wasn’t happening. So started off home and remembered a train passing I liked about 5 mins away. Pulled over and checked the Train schedule and a train was due in about 15 mins and coming in right direction. The sun was shining in my face, there was no sidewalk – so had to jump out every time there were no cars, the colors weren’t warm, wanted to get train in blur and I only had 1 passing of the train. It all worked out somewhat in the end, although I think I will make more visits in coming weeks to perfect the shot. Also, so many people have asked me how I take my shots and how I edit, but don’t want this blog to become a “how to”, although I want to help and share as much as I can. I did set up a separate page called “tutorials” above. So take a look and I’ll show you how you can get this information from me. No cost, no obligation and to your inbox. I am open to suggestions. Enjoy. Kenneth, what a fab picture. Do you ever sell them? I would love to have a copy of this. I am flattered. Just sent you an email. Great photo and story behind it! 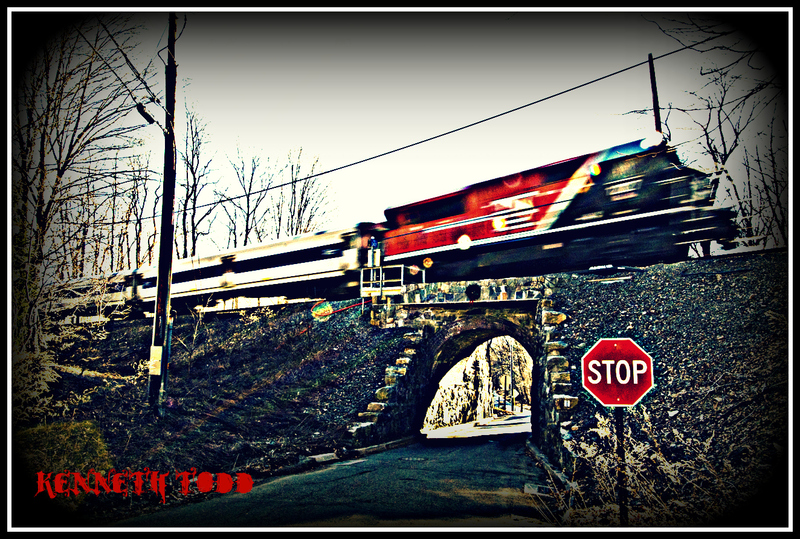 The red of the stop sign, the engine and your watermark provide great visual balance. Nice! and I was just about to ask you about your editing software 🙂 Lovely shot especially because you only hat one chance to get it. Great shot! I love the blur and color. I’m glad you didn’t get run over! Sounds like it was worth all the work to get it. Love your colour work and everything!! Great shot. I’ve tried this a few times myself with the commuter rail line where I used to live…wound up just getting a schedule and keeping it handy :-). Keep shooting! I love motion blur train shots! Great photo!